The third day of Saraswati Puja during Navratri is known as Saraswati Balidan day. The fourth and final day of Saraswati Puja during Navratri is known as Saraswati Visarjan day. Saraswati Visarjan is also known as Saraswati Udvasan (उद्वासन). 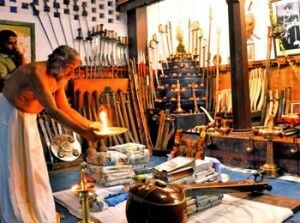 Historically Ayudha Puja was meant to worship weapons but in its present form all sort of instruments are worshipped on the very same day. In South India it is a day when craftsmen worship their tools and instruments similar to Vishwakarma Puja in other parts of India.